The trip of a life time! If you’ve never been to Rio de Janiero, you must go! Sites! City! Beaches! 7 Wonders of the World! One of my very favorite vacations I’ve ever taken was to South America. We spent 2 weeks visiting the highlights including: Rio seeing the Corcavado and Sugar Loaf Mountain, partied at Carnival, hiked to Machu Piccu in Peru, Iguacu Falls, Buenos Aires, to name a few. My father was President of the Rotary Club, so he took all of us to South America for the International Rotary Convention held in Rio De Janiero, Brazil. We met other Rotarians from as far away as Egypt in their cultural outfits. Walked up to the breathtaking Christ Reedemer in Rio (one of the 7 Wonders of the World). What an amazing site! Such a gigantic statue of Jesus spreading his arms over all of Rio with the spectacular Sugar Loaf Mountain in the background. Such a spectacular site and one I will never ever forget. You feel so small standing next to it. Rode the sky ride at Sugar Loaf Mountain. What a surreal experience having only seen it in the movies. Bought bikinis in Ipanema. Literally 7 fit in my makeup bag, they are that small! Lifted weights on the beaches of Rio de Janiero! Love that everyone does their workouts on the beach! Hm. 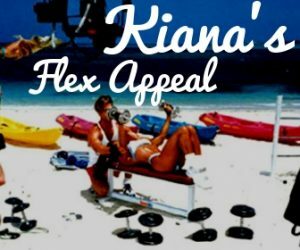 Alot like Kiana’s Flex Appeal! Played tennis on clay courts in Peru. Love playing tennis and to actually get to play on a clay court in Peru was so much fun! Bought handmade blankets, beanies and coin purses made of llama fur from the locals. The mothers had their little babies on there back. They are all super tan with big white eyes and soulful faces. “Poor Niagara!” is what First Lady Eleanor Roosevelt is said to have exclaimed upon glimpsing this stunning set of cataracts on the border of Brazil and Argentina. She was right: many great waterfalls like Niagara are something to look at in wonder, but Iguacu is so grand it takes days to explore, with visits to both sides of the border required. Its rough horseshoe-shaped lip spans nearly two miles and is dotted with islands, dividing the curtain of water into as many as 300 separate cascades. The most famous is the Devil’s Throat, 250 feet high and nearly 500 wide – by itself bigger than most of the world’s larger waterfalls – but it has hundreds of dramatic siblings. National Parks on both sides of the border and falls are UNESCO World Heritage Sites, and between them, boast a wide assortment of falls view hotels, hiking trails, walkways, sightseeing buses, an eco-railway and even helicopter rides. The falls can be viewed from several different angles, perspectives and proximities. It is wider than any of its chief rivals, Angel’s Falls, Victoria Falls and Niagara, which it is second to in sheer water volume. It is the broad panoramic aspect and multiple cascades that make Iguacu so notable, and why it was named one of the New Seven Wonders of Nature in 2011. Forbes. Saw the dramatic Devils Throat waterfall. This is a huge waterfall, the size of 7 Niagra Falls. When we visited, there was NO safety rail or walkway like in the image above. They only had a flimsy rope bridge to walk over which was quite scary but added to the energy and power of the waterfall! During our rope bridge walk, black butterflies circled all around us. When the butterflies opened their wings, they were bright yellow or red inside their wings. Visited the capital of Brazil, Brasilia. It was very futuristic looking. I loved this Cathedral and especially the sculptures hanging form the ceiling. Hiked to one of the 7 Wonders of the World, Machu Picchu. We were told to eat cocoa leaves to help keep our heart rate low in the high altitude. We hoped on the one way train that goes up and then backwards going down. How amazing to see the huge stones that weigh 100 tons each, placed to make a gigantic city high up on a hill. How did they get those huge stones up on the hill?